Salvinu Schembri was a product of the war. Barely in his teens when hostilities broke out, he was drafted into the army, joining the 1 Coast Regiment RMA. In those days, the Maltese regiment had a formidable team. many of the best Maltese players of the time were in uniform, and most of them served with the 1 Coast Regiment. During the war, the island was swarming with British professional players. Schembri could not have had a better football apprenticeship. He played for his regiment in the United Service League and in the many competitions organised by Mr Scicluna at the Stadium. By 1943, the war in Malta was nearly over and the MFA embarked on an extensive programme of organisation. Salvinu joined Sliema Wanderers or, rather, Sliema Athletic as they were known in those days. He stayed at Sliema for two seasons before joining Valletta at the start of season 1945-46. It was a great era for the Citizens. Between 1945 and 1948, they won the league championship twice and the superstar of that fine team was Salvinu Schembri. Schembri was a dream footballer. In his best days, he could play with any team. A clever inside-foward, he was the master of what is known in football as 'running off the ball'. He would start an attack with a quick pass to his winger, or centre-foward, and then 'ghost' into position to receive the return pass. he made it all look so easy and eight times out of 10 the ball would end in the opposing team's net. There has never been a more intelligent player than Salvinu Schembri. He could read the situation in a flash and then wait until his colleagues took position in a flash and then wait until his colleagues took position before splitting the defence with a perfect through pass or a deadly shot at goal. He was so clever that one could almost hear his mind ticking! Zabovresky's match against the Floriana-Valletta combination was a tribute to two of the greatest footballers ever produced by the game, Salvinu Schembri and Leli Cauchi, who showed that they had the skills and talent to beat the visitors at their own game. Schembri was yards faster than any of his opponents. His footwork was impeccable and he made two of the three goals scored by the combination. Cauchi scored one of the goals, the others coming from Pearson and Bennetti. The Maltese won 3-1 and at the end the crowd rose as one to applaud its conquering heroes. Schembri certainly played the greatest game of his career against Zabovresky but this team was a bad omen for the Maltese star. The game between the visitors and the MFA XI played on January 19, 1947 should have been a tribute to Schembri. A huge crowd filled every corner of the Empire Stadium to watch him in action but unfortunately he was seriously injured in a reckless tackle by fullback Slavic and he had to be carried off to hospital. Schembri was forced to stay out of the game for three months. Valletta dearly missed his services and after losing in the Cassar Cup final against their rivals Hamrun Spartans, they made every effort to have Salvinu back in the team for the crucial league match against the Spartans. To make matters worse for Valletta, the army quthorities refused to give Schembri permission to play for his club because they were afraid that he would aggravate his injury. In the week before the big game, speculation rose about whether or not he would turn up for Valletta. The big day arrived on Sunday, May 11, when the league leaders met in what was considered to be the decider for the championship. A hush fell on the ground as the two teams trooped out of the dressing rooms. To the joy of the Valletta Supporters and the dismay of their Hamrun, counterparts, Schembri led his team out on the pitch of the Empire Stadium. Salvinu made all the differences to his team. Playing very discreetly from behind, cunningy tested his injury, he waited for the right moment to take his chance and score the winning goal for Valletta. 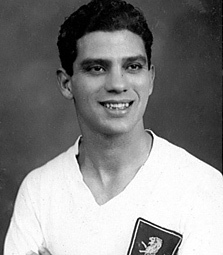 Schembri stayed with Valletta up to the end of 1953 when he rejoined Sliema Wanderers. It was the start of another great period for Schembri. Now more mature and skilful as ever, he became the mastermind behind the great Sliema team of the era. In seven glorious season, he helped the Blues win three championships, the FA Trophy, the Cassar Cup and the Scicluna Cup twice. Salvinu was one of the most honoured players of his time. An automatic choice for the national team, he played 35 times for the MFA XI. In 1956, he had the honour of leading the team in Malta's first ever international against Austria. He went on to play two more international matches before he retired in 1961 after spending an eneventful season with Hamrun Spartans. His only dissapointment was that he never won the Footballer of the Year award, an honour that he fully deserved but somehow always eluded him.